THESE are my greatest weakness…and tonight I succumbed. 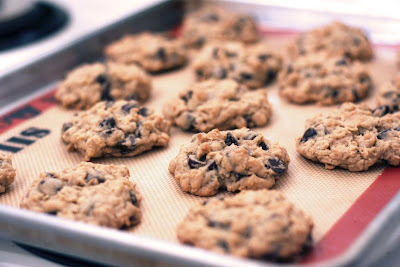 Warm cookies, about 10 minutes after they’ve come out of the oven. I wish I could resist, but I just can’t. I need a support group. Or maybe I just need to stop making the cookies. Yeah, right. Your menus are always great inspiration as I plan. Thank you for always sharing! I need to mix things up a bit, so I’m going to start stealing ideas for things I haven’t cooked before. SOOOO…if I steal one of your menu items from a previous week and you have any tips/recipes I should know about, please share! – No, we haven’t had Orange Chicken 3 Sundays in a row…I just keep not making it because I’m LAZY. I suppose it makes for easy planning, this way! Okay, friends…ready, set, go menus! Looking for a fast, super easy dinner? Maybe even one your kids can make? Look no further… (Wow, do I sound like a commercial or what?) 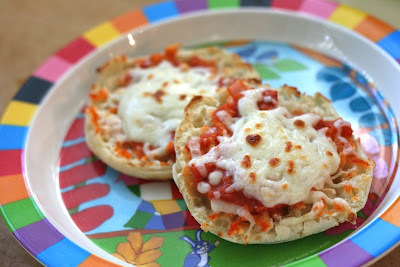 English Muffin Pizzas are here to save the day! Super easy for your kids to make. Very customizable for each member of the family. ANYWAY…Nate reminded me of them this past week and it seemed like something Cate might like. She had a lot of fun making her pizza, and they honestly, truly tasted good. I was even a little surprised how much I liked them. There you go, easy, kid-friendly. And, if you have a toaster oven, you can bake OR toast them in there and don’t have to heat the oven in this hot summer weather. I just put a little foil over the toaster oven tray and I didn’t even have pans to wash. Awesome. Let’s get corny, shall we? And I’m not talking stupid jokes, although those can be fun, too. No, it’s time to pull out all the stops on your corn recipes! It’s in season! It screams summer! Bring it on my friends! 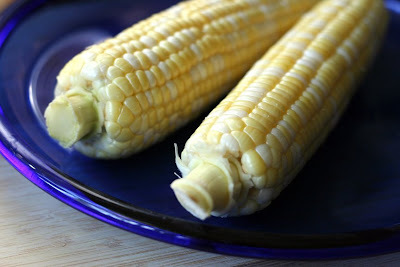 What’s your favorite way to eat corn? 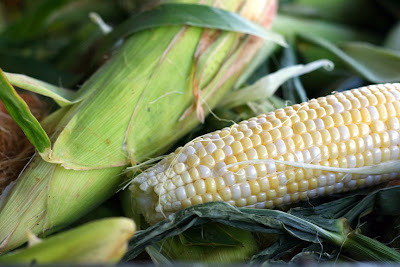 Do you have a great corn recipe? Please share! Cate and I stopped at a local produce stand today to grab a couple of ears…the people whose ears we grabbed were not amused. Okay, bad joke, I know, but this is a corny post after all. We simply boiled, seasoned and ate, which is pretty darn good in and of itself. 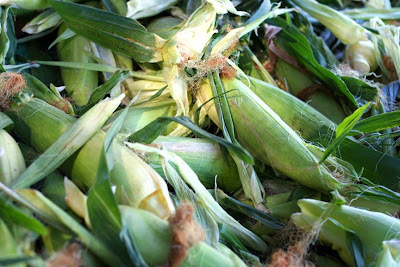 But I’m certain there are more fun things we could have done with our cobs of corn. Now it’s your turn…recipes, tricks, tips, memories…if it’s corny, I wanna hear it (and so does everyone else)! My favorite pizza place in San Diego is Leucadia Pizzeria. 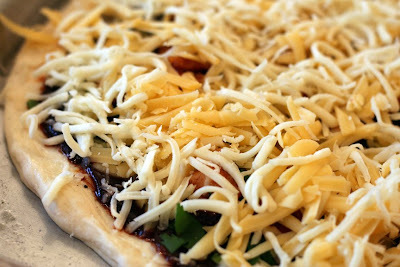 My favorite pizzas at Leucadia are Thai Chicken, Hawaiian and, today’s featured recipe, Barbecue Chicken. 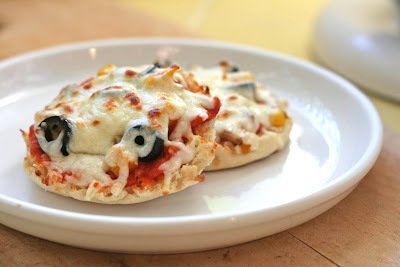 Since they won’t deliver to the Bay Area, I’ve had to try to recreate these yummy pizzas at home. Simple with a lot of flavor! The BBQ chicken pizza is quite simple. Barbecue sauce, chicken, gouda cheese & cilantro. That’s it, you’re done. I do a mix of gouda and mozzarella cheese so that it’s cheesier (one block of gouda isn’t QUITE enough cheese). Also, the Kansas City BBQ Sauce from Trader Joe’s is mighty fine. 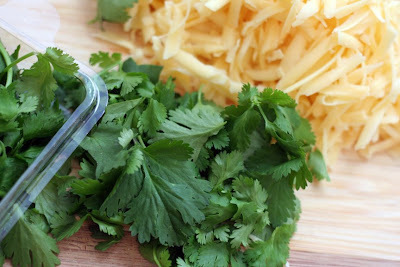 PS – The cilantro is KEY. Make sure you put a whole bunch on there (I chop it up before). It gives it the best flavor. Pictured: Yet another delight from Tartine in San Francisco. 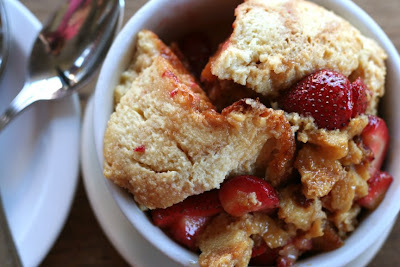 They are famous for their bread pudding…with good reason, my friends. Okay, enough dreaming about bread pudding. Focus, Jane. Menu time. Before I get to today’s Kitchen Tip, first let me highlight this delicious salad dressing! 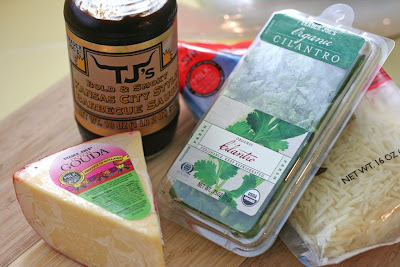 The Champagne Pear Vinaigrette with Gorgonzola from the Trader Joe’s refrigerated section. My new favorite! Okay, on to the nitty gritty. Today’s Kitchen Tip is more of a “don’t be as dumb as me” post. We were in charge of bringing salad to a work BBQ last night. I put together a lovely spinach, strawberry and candied pecan salad. The BBQ was just down the street from us, so I decided to dress the salad before we left. BAD MOVE. No matter how close the party is or how soon you THINK you’ll be eating your salad, don’t dress until right before! I know, seems like a rookie move, but I honestly thought it would be okay for 15 minutes. Here’s what happened…by the time we got to the party, the salad was honestly and truly HALF the size. By the time we ate, it was more like creamed spinach than a salad. It was like I’d been simmering the spinach on the stove the whole time. Not so yummy. And totally embarrassing. 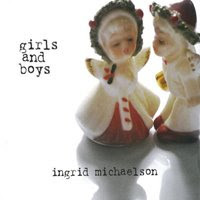 Have you heard Ingrid Michaelson’s music? It’s great, isn’t it? If you haven’t, here’s a link where you can go listen! I really like the whole album. The Hat was playing in the background the other evening and I found myself really enjoying it. So, it’s the Song of the Week. But The Way I Am is lovely and adorable. It makes me smile. Okay, no more music and radio shows. My next post will be about food. I promise! I LOVE This American Life and I have two things to say about it. 1) If you haven’t started listening to This American Life, get going already! 2) If you do listen to This American Life, that means you know how awesome it is. And how great it is you can get it as a free podcast or online. And since I love This American Life so much and I really want to keep getting it as a free podcast, I’m going to do a little plug for them. They need to raise money in order to keep the free podcasts and free online streaming. If you want to support them, head on over to the website. Even if you don’t want to donate, please go listen. It is seriously good stuff. Here are just a few of my favorite episodes to get you initiated. You can also click here for their list of favorites. I am very excited about today’s Kitchen Tip because I just discovered that it is actually true. Woo-hoo! But to get to the tip, you need a little background info. Bear with me, here. One day when I was cooking with my grandmother, I couldn’t find a tablespoon. She told me to grab the serving size spoon from her silverware set and assured me that it was in fact the same size as a tablespoon. I did as I was told, but remained skeptical. After all, that serving spoon just seems way too big. She then told me that the soup spoon is the same as a teaspoon. Again, skeptical. Soup spoon? That’s gotta be too big as well, Grandma. A few weeks ago, my mother-in-law and I couldn’t find any measuring spoons. I brought out Grandma B’s little-known spoon fact and was met with skepticism, which didn’t surprise me since I myself was still questioning the “fact.” But we went ahead and used the advice for the recipe and it seemed to work. Today I decided to put the issue to rest. I compared the amounts from each of the spoons side-by-side and, sure enough, Grandma was RIGHT. I mean, are Grandmas ever wrong? I should never have doubted! So here’s the tip: The serving size spoon from your regular old set of silverware is in fact 1 tablespoon. 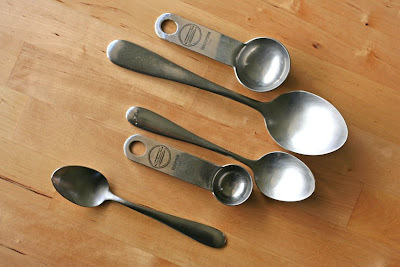 And the soup spoon size (pictured in the middle) is in fact 1 teaspoon! The smallest size spoon from your silverware set (pictured bottom)…that is probably something too, but I ran out of funding for the experiment. Good morning! 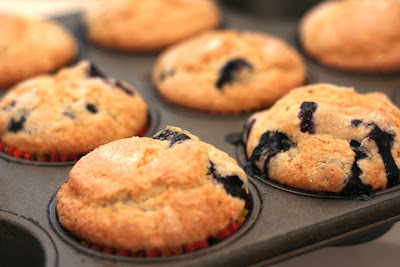 I am on FIRE today…it’s only 9:14 AM and I am showered, I just pulled a pan of muffins out of the oven, there is a load of laundry in the washing machine, both girls are bathed and fed, and I’ve got my weekly menu done. Pigs must be flying in you-know-where. In fact, I think they’re throwing snowballs, too. Cori and/or Meghan…do you have a recipe for your Chicken Poppyseed Casserole?